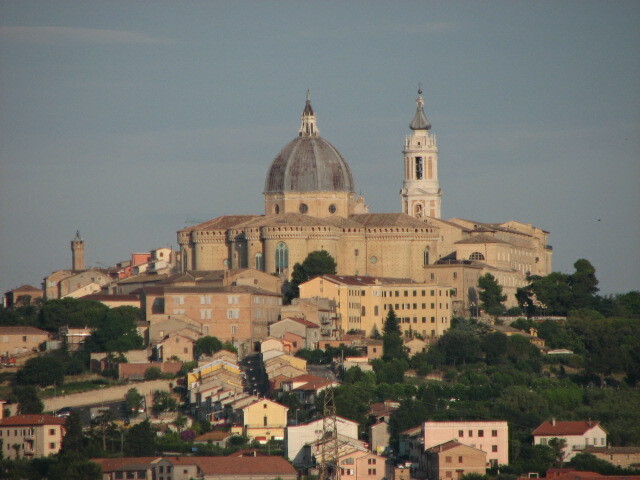 Near Ancona is the hill town of Loreto, an international pilgrim Mecca since it hosts the House of Maria. 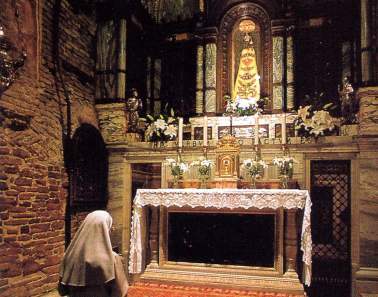 That Maria, the mother of Jesus. You may wonder what it’s doing in Central Italy and also why it’s so Baroque, with dark black stone walls, a lot of gilt, elaborately carved stools and lamps hanging from ornate wrought iron fixtures. There are several theories. The one I heard first is that angels hoisted the house from its foundations in Jerusalem and took it for a few centuries to Croatia. There are lovely beaches there, which may have been the attraction for Angelic Transport, Inc. In any case, in due time, the angels up and flew the house across the Adriatic. Where to put it now? The thing must have been heavy, even for angels. By Loreto’s good luck, an arrow-shaped rock formation off the coast clearly pointed to Loreto, a poor hill town at the time, lacking unique resources or pilgrim attractions. The angels set down the House in the main piazza, minus one wall which had fallen away during transport. These things happen. Then the angels went off or up or wherever they go. The grateful town built an ornate church around the House and suddenly Loreto was on the map. As you can imagine, the House of Mary was a far, far better draw than the umpteenth nail from the Cross. The second theory is that a returning Crusader, devout, credulous, or merely mercenary, by the name of Angeli (that is, “Angels”) acquired the House for ready cash. Lacking literal angelic transport, he had it disassembled, packed with instructions (IKEA-like) and transported by ship. I read somewhere that its first stop was Naples but then came north as part of a noblewoman’s dowry in the 16th Century. This timing is strangely congruent with the architectural aspect, but let’s not be cynical. There are other theories but we move on. A couple years ago I was taking friends to Loreto and my father in law, then rapidly declining, announced that holy water could cure him. Cesare had never been practicing, devout or particularly superstitious, but it was a modest request from a very sick man and I promised to get some. Outside the veritable House of Mary, I figured, holy water must be as easy to buy as postcards. Not quite. My friends, Daniel and Jeannine, are practicing Catholic, but not of the Holy Water kind, and a childhood of white-bread Protestantism left me quite unprepared. The process was so self-evident to my informants and so non-intuitive to me that in the end Daniel and Jeannine, just sat down on the sunny steps to the church and watched, bemused, as I went to and fro on my mission. So I took my package to the marble fountain in the piazza, unwrapped the little vial and tried to fill it, which was tricky, since the opening was small and the fountain gushing. Back to the church, threading through pilgrims, many in wheel chairs, I asked around and finally directed to line snaked in front of a weary, bearded friar-looking fellow in a brown robe seated at a high desk. The line moved slowly, then stalled when the couple head of me reached the friar. Only then did I notice their shopping bag. Out came pictures of (I supposed) various family members, a couple cars, a cat, a beach house, a pregnant woman. There were keys put on the desk, a couple rosaries, some envelopes, various vials of water. A water bottle. All for a euro, quite a bargain, but I wondered in panic if every item needed separate blessing. Apparently not. The friar blessed the objects in batches and in 15 minutes the blessings were done and the now holy mess shoved back into the shopping bag. I had been pondering what to say about Cesare’s condition, but there was no need. When my time came, the friar stared fixedly at the “offerte” slot; I put in my euro; he muttered something over my vial; made a weary cross and that was that. Threading out to the blinding sunlight where Daniel and Jeannine were patiently waiting, I felt closer to Martin Luther than ever in my life. I wish I could say the water helped. My mother in law dumped the vial into a glass of tap water and gave it to Cesare, who I think had already forgotten his request. His condition did not improve. But I had been a good daughter in law and that’s its own small blessing.